Tafoni types. Tafoni are often categorized into different types of tafoni, or sub-classes, including small and large tafoni, honeycomb-like cavities, and nested tafoni. 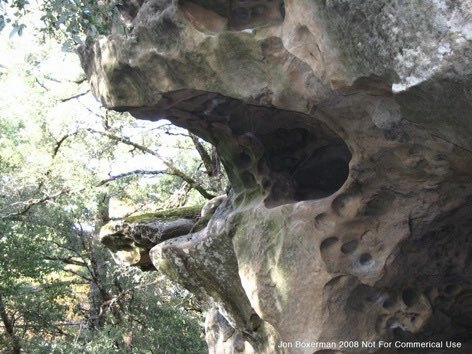 Some researchers classify tafoni structures by size or volume (e.g., large or small), morphology (e.g., broadly rounded or cellular), and location of development (e.g., cliffs faces or boulder bases). 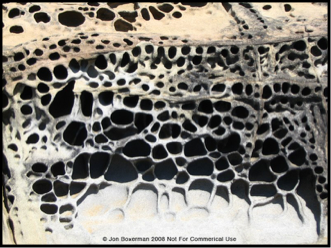 The Encyclopedia of Geomorphology (Goudie, 2003) defines tafoni and honeycomb as two types of cavernous weathering that possess clear convergence of form. 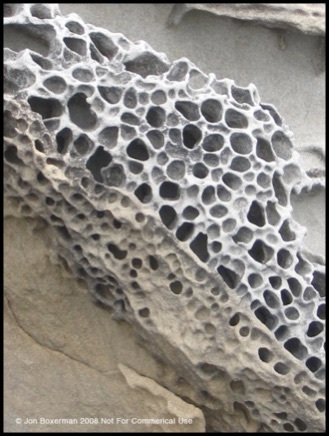 This same definition also states that the relationship between tafoni, honeycomb, and differential weathering processes is poorly defined. 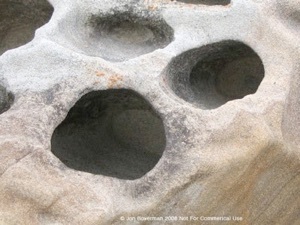 The literature points toward tafoni and honeycomb as types of cavernous weathering patterns, and honeycomb a sub-class of tafoni because they both they are related by similar geometric structures and weathering processes. However, differences between types of tafoni lacks precision, particularly when different types of tafoni are nested inside one another. Small and Large Tafoni. On the same rocky outcrop or cliff face, tafoni volumes can vary significantly, from millimeters to meters. Blackwelder (1929), in one of the earliest published accounts of tafoni, describes the tendency of pitted, honeycombed, and cavernous surfaces (what he broadly calls “niches”) to range in size from “an inch or two in breadth…to large enough to shelter a horse and rider”. Blackwelder notes a great variety of forms associated with cavernous surfaces, which he observed in various deserts across the southwestern US. Rodriguez-Navarro, Doehne, and Sebastian (1999) could not resolve in a laboratory what controls the scale of tafoni features; morphological and geological distinctions between small and large tafoni remain unresolved. Small tafoni (centimeter- to decimeter-scale). Reticulated with relatively closely spaced cavities (Bartrum, 1936). 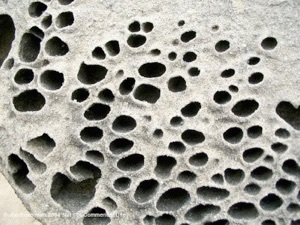 Sometimes tafoni possess raised lips encircling cavern entrances (see below). Large tafoni (decimeter- to meter-scale). Typically helmet-shaped outer roofs and arch-shaped caverns with overhanging lips, hoods, or visors (Mellor, Short, & Kirkby, 1997, McBride and Picard, 2004). Visors, associated with large tafoni are lithologic overhanging shelves that look like an awning, a canopy, or the fore piece of a cap. Goudie and Viles (1997) note that not all large tafoni possess overhanging forms. They suggest that a more resistant, case-hardened outer layer is not necessarily a prerequisite for this overhanging feature to develop. Instead, visors could be a product of differential weathering in an upward and backward direction. Honeycomb. Clusters of well-developed small tafoni, also known as alveoli (named for the cell-like sacs found inside the lungs), alveolar weathering, fretwork, “stone lace” (Bryan, 1928), stone lattice, and honeycomb weathering. These cell-like forms usually have thin walls and appear delicate. Researchers tend to define honeycomb as small, closely spaced, centimeter- to decimeter-scale, circular to rectangular, cell-like pits and depressions separated by well-defined walls. Viles (2001) characterized the spatial scales of honeycomb from millimeter to centimeter and tafoni from centimeter to meter. Winkler (1979) hypothesized that tafoni and honeycomb are genetic relatives, and Gill (1981) and Matsukura and Matsouka (1991) use the terms honeycomb and tafoni interchangeably. Nested. 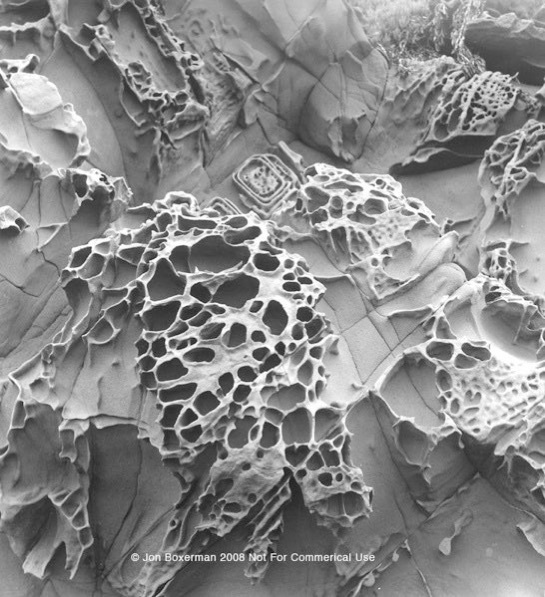 Tafoni ranging in sclae over many orders of magnitude, from several millimeters to many meters, typically do not co-occur in the same geographic setting. Nonetheless, tafoni do vary significantly in size on the same outcrop, which supports a classification quandary. There are many well-documented examples of multi-generational tafoni, millimeter- to decimeter-scale. Cavities often nest within larger tafoni. It is unclear why some tafoni develop as fractal-like structures while others do not. To some, small, large, and nested tafoni implies common weathering or internal processes for the genesis of the tafoni observed on that outcrop. 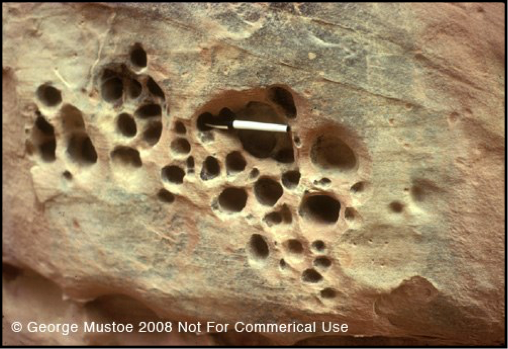 On the other hand, Grantz (1976), Mustoe (1982), and others suggest that different sized tafoni, nested or otherwise, do not necessarily signify like geochemical or geophysical origins. 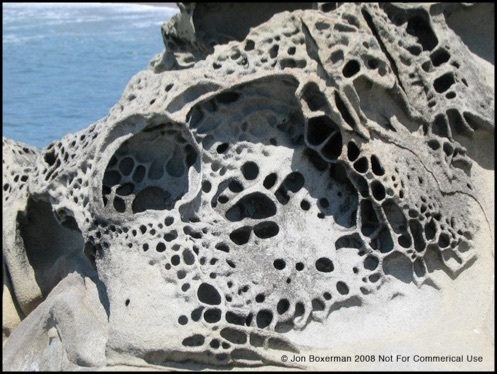 Nested tafoni are found in coastal and desert areas (see below) and can span more than three orders of magnitude (mm to m).